Home >> Hey Gushers, Leave our Kids Alone! Hey Gushers, Leave our Kids Alone! Previously I wrote about how my son went on a vegetable-eating strike a few months’ shy of his second birthday. Today at 4 years old, he has not picked up a veggie OR put down his picket sign. (You can find some resources to help with picky-eating on my previous blog post). But if my husband and I thought we were in a battle for healthy eating before, this summer we realized we’re actually in a war. For us the summer began when the movie the Incredibles 2 was auspiciously released on my son’s 4th birthday. We didn’t need any more signs than that to make my son’s first-theatre-going experience an EVENT by seeing this hugely-anticipated movie on his special day. First, while grocery shopping with both sons, the baby sitting in the front of the cart and my older son holding onto the side of it like it was a garbage truck (one of his favourite pastimes), I passed by some of the middle aisles when abruptly my older son flew off the side of the cart, darted into the adjacent aisle before I could speak or see if anyone was coming; his arms were outstretched, and he yelled, “Jack-Jack!” with the same loving intensity he used to yell “Mommy!” when I first started picking him up from daycare. My son’s disappointment was palpable. It became obvious to me that not only was I saying no to something he suddenly and fiercely wanted, but that I was saying no to his friends and/or some promise of greatness. I was pitting myself up against the charismatic charm and wisdom of the Incredibles themselves. How confusing. The second thing to happen was after spending $285 on a grocery order, we received a free promotional pack– a large, colourful box full of a big-brand’s products. Thinking that it was a free gift, we placed the promotional pack on the top shelf in our storage area where there was room. What we hadn’t realized was that in fact, it was a Trojan horse. One afternoon, I thought my son was busy playing with Lego at the kitchen table while I put the baby down for a nap but when I came downstairs, he was gone. I followed a few Lego pieces down to the storage room and it turned out my son wasn’t busy with Lego at all, but busy ‘MacGyvering’ his way to that large, colouful box on the top shelf on a mission to free the Fruit Gushers. He had figured out a way to climb over the locked baby gate, get down 14 stairs without me hearing him, remove boxes of recycling piled on top of the broken exercise bike; climb on top of said rickety bike, stand on his very tippy toes while reaching with all his might for the promise of candy. I didn’t even know Gushers were in the promotional box, let alone that he even knew what Gushers were. When did we ever talk about “Gushers”? Or when did he have a chance to eat or see them? On TV or a YouTube ad? At preschool? My son asked me, no scratch that, begged me for those Gushers at least six (hundred) times that day and the next day they went with my husband to his workplace. The third thing to happen was another Trojan horse. 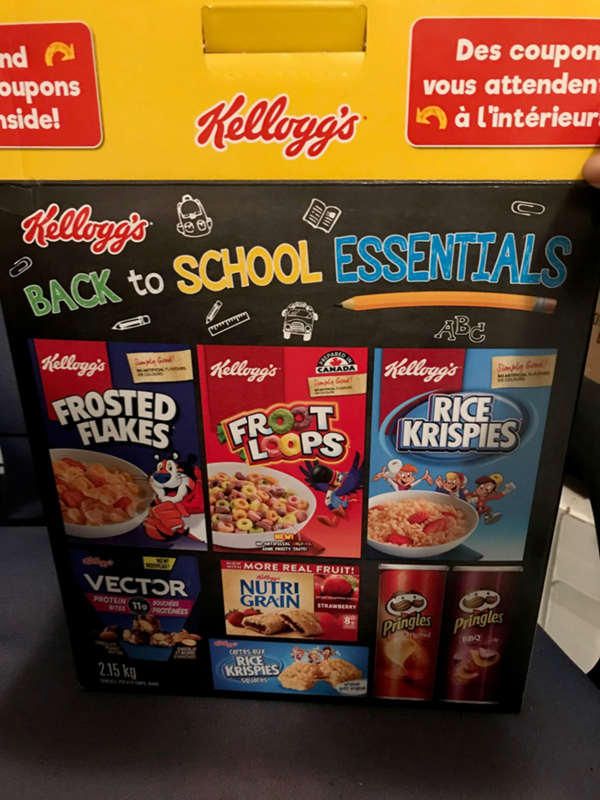 It was near the end of the summer when we brought home the second Promotional Pack, this time a ‘Back-to-School Essentials’ box which included some Rice Krispies treats and Pringles- for spending just over $250 on a grocery order. Once that promotional box was in our house, it was like it grew tentacles to my son’s brain, programming him to ask for the treats every time we turned around. And to our chagrin weeks and even months later, he still runs to the car with an eager hop when we’re headed to the grocery store just in case we might get Gushers or chips again! There are many battles I have fought and lost as a parent but it was a particularly hard loss when we realized that our sock puppets and broccoli brain stories weren’t going to coerce, er, I mean happily cajole, our son into eating vegetables. Any vegetables. But the idea of my veggie-protesting son immersed in a world, further outside of my control, where junk food looks magical, fun and hero-worthy keeps me up at night. This is a world where all his favourite trusted superheros are hired to manipulate his young mind into begging and buying things that are poor for his health. In that same world, we, the parents, will continue to be faced with strategically situated superboxes, double-edged freebies and Kinder checkouts and the constant disappointment for trying to do the right thing – picking our families balance. This has all come too far. And to be frank, a parenting class is not going to fix this one. But maybe legislation will; legislation that protects children and supports parents. Call or email Senators to let them know this is an issue you would like to see prioritized before the Senate adjourns for the holidays. My son may not eat carrots but maybe with your help he won’t be surrounded by the temptation to eat Gushers either.